Yo, That Strawberry Shortcake is Stacked! Summer may be over but there’s still time to channel its sweetness into your chilly abode. Strawberries are available year round and make a delicious addition to your holiday dessert menu. Unlike the cake pops and mini -pies that will inevitably cover tables across the nation, this totally portable recipe is guarenteed to be a table-topping stand out. Ready to be the hostest with the mostest? Then Lets Do the DIY Thang, shall we? The staples for this awesome treat are beyond easy – strawberries, pound cake, whipped cream and skewers. (Chocolate Drizzle is optional, although highly recommended!) Cut the cake into 1”x1” squares and cut the tops off the berries. 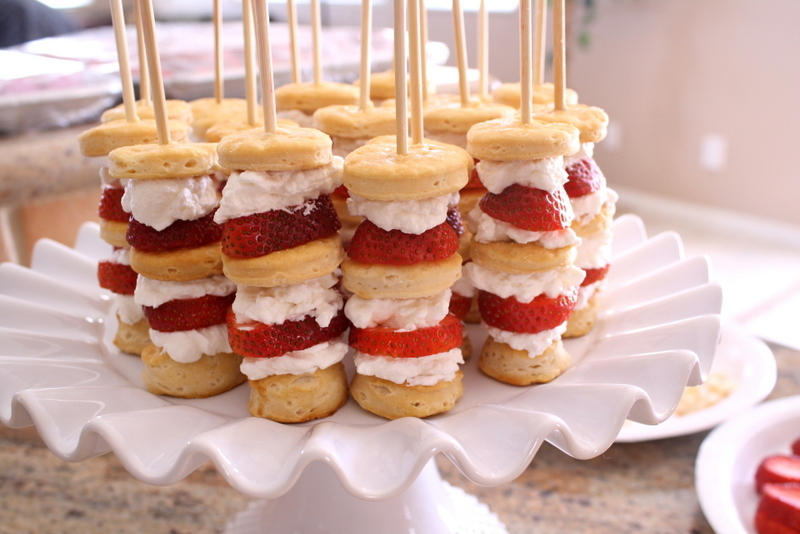 Then slide them along the skewer alternating between cake, berry, cream – cake, berry, cream, etc. Once you’ve stacked your skewers to perfection, this little number is done and done. If you’d like to make them a tad bit sweeter and a whole heck of a lot more irresistible, then go for the drizzly gusto of chocolate! The best way to melt chocolate, we think, is the double boiler method but if you’re fresh out of ‘em, dont fret, the alternative is easy. Boil a pot of water and put a bowl that is heat safe to use on the top of the pot, adding the chocolate and a little oil to help thin it out. After the chocolate melts it, move it to a plastic bag, cut the corner, and squeeze the chocolate all over those beautiful kabobs. Put in the fridge for about 30 minutes so the chocolate will harden and VOILA! A deliciously easy treat that’s guaranteed to please….so much so it’ll make your clean up a snap! Aside from it’s simple & portable nature, another awesome thing about this DIY Ditty is that you can literally alter it in any way you please. Using different flavors of pound cakes, or shortbread minis (as used above), varied types of fruit and more all make this a completely customizable recipe that will leave you totally inspired. For our next spin on this skewer, we’re thinking of adding mint……Hmmm….We see a “Kristmas Kabob” post coming on soon! Stay tuned and enjoy! 4 responses to Yo, That Strawberry Shortcake is Stacked! Thanks Leelo, they’re so easy and totally delish!